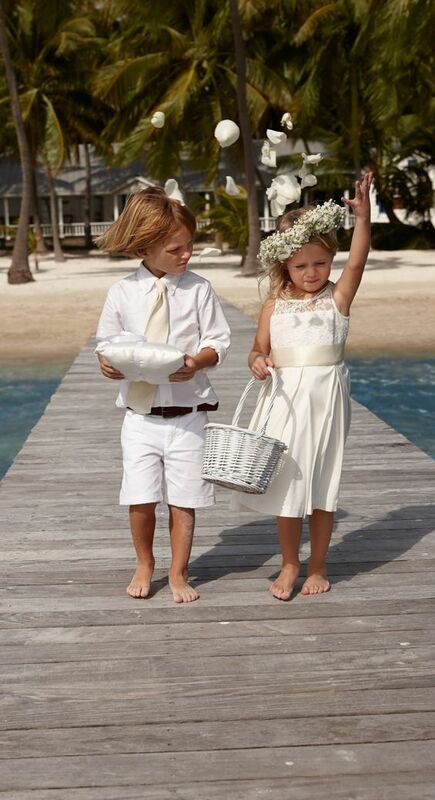 Summer wedding season is coming closer and I’m sure that only the last preparations are left. 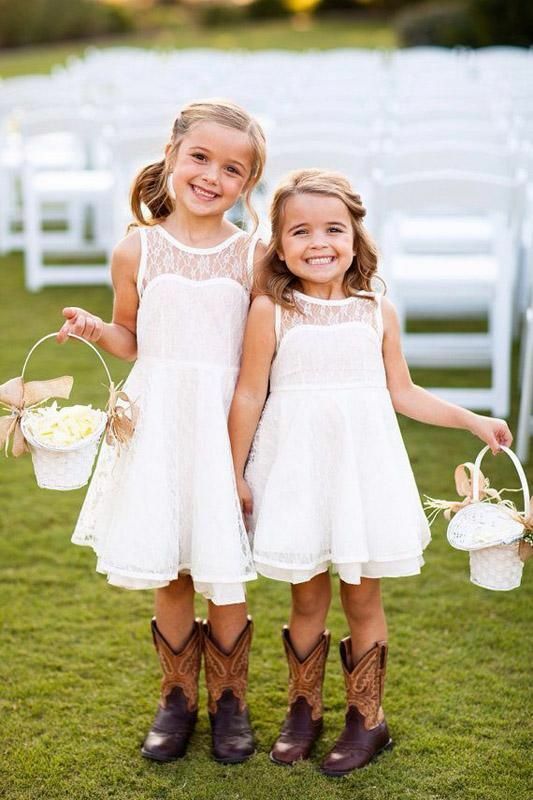 Forgot to dress your smallest maids? 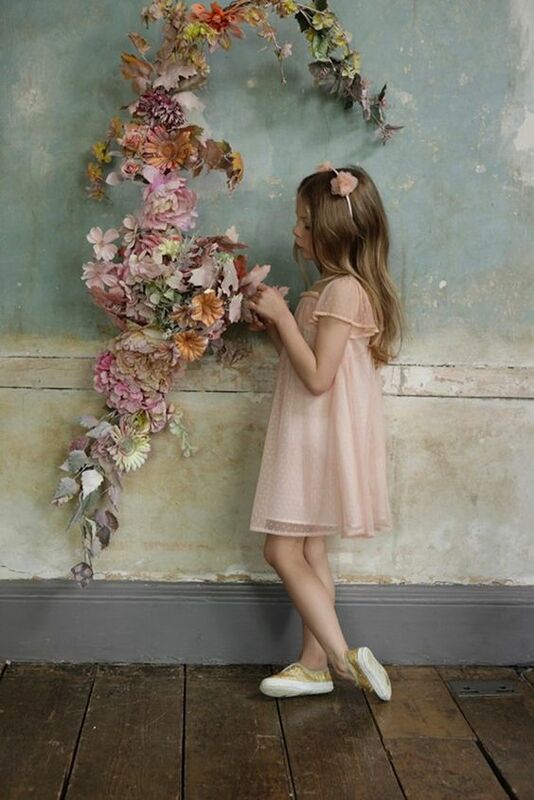 We are here to help you because nothing is sweeter than little fairies with flower petals, believe me! 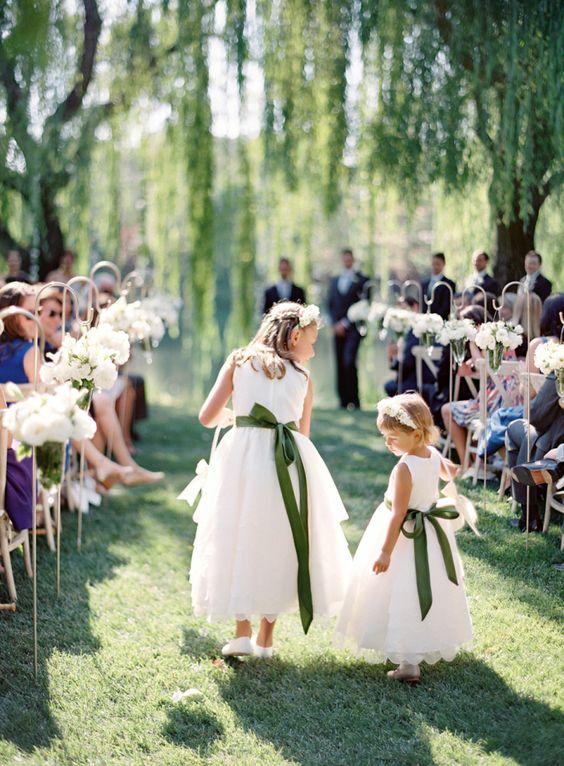 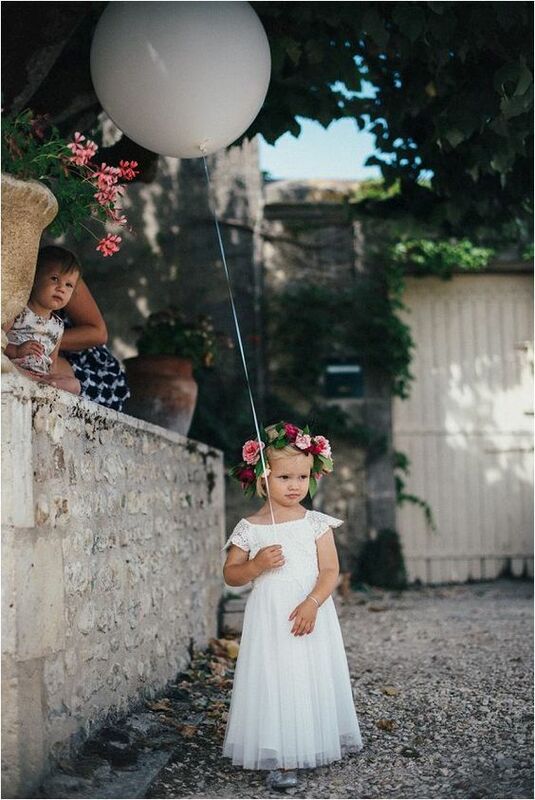 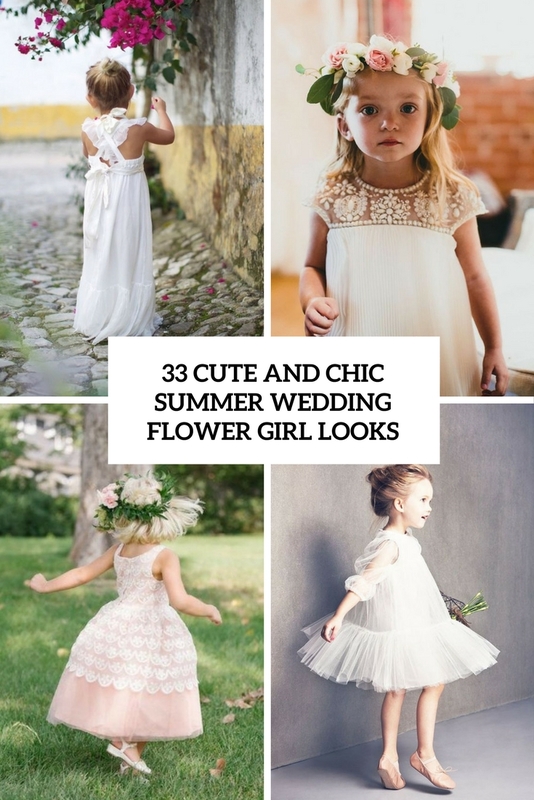 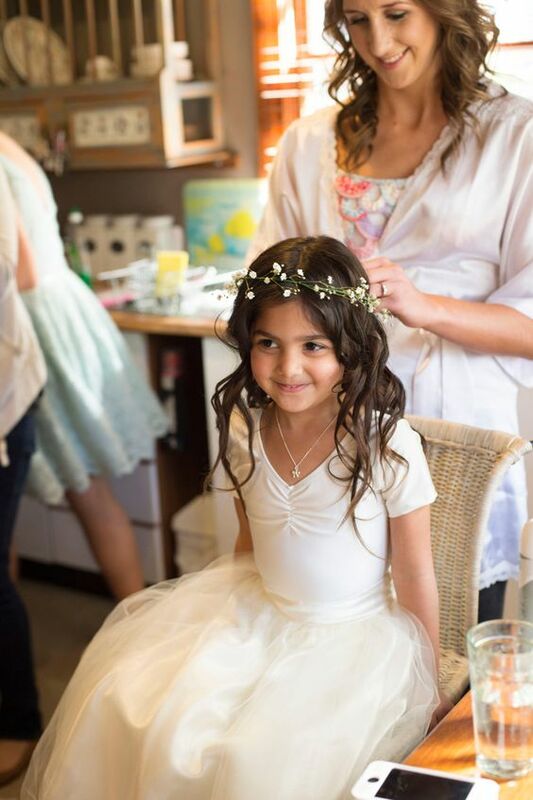 There’s a plenty of ideas to dress up your flower girls and lots of colors and accessories to choose from, according to the style of your wedding. 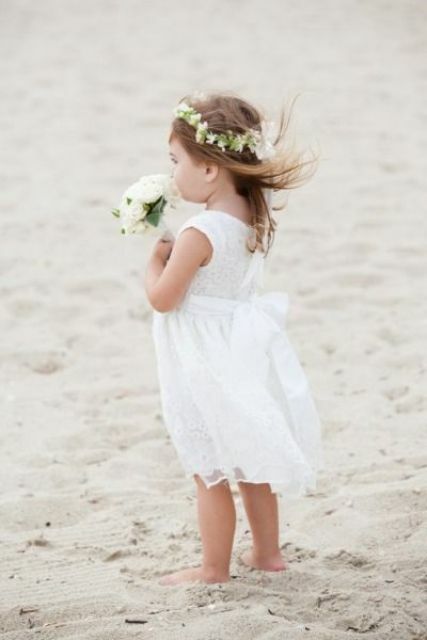 The common tips are choosing light fabrics and flowy dresses especially if it’s hot, and to find cool matching sandals. 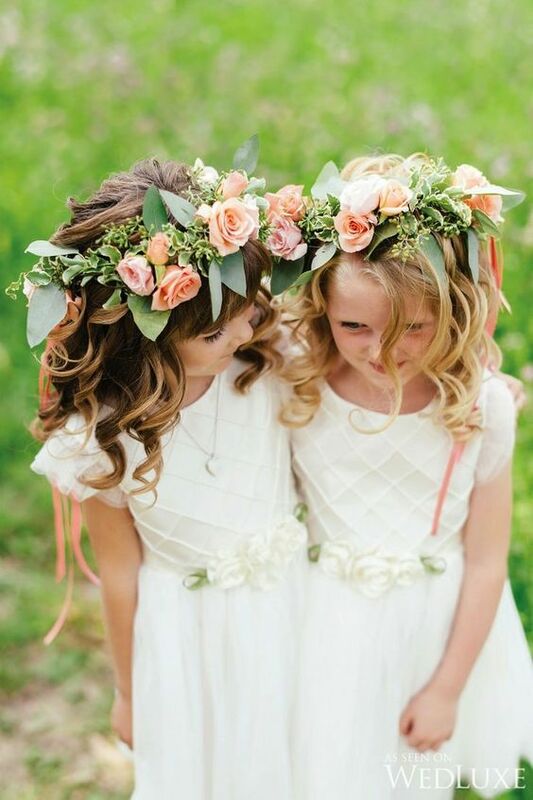 Don’t forget about adorable leaf or flower crowns for the girls, too! 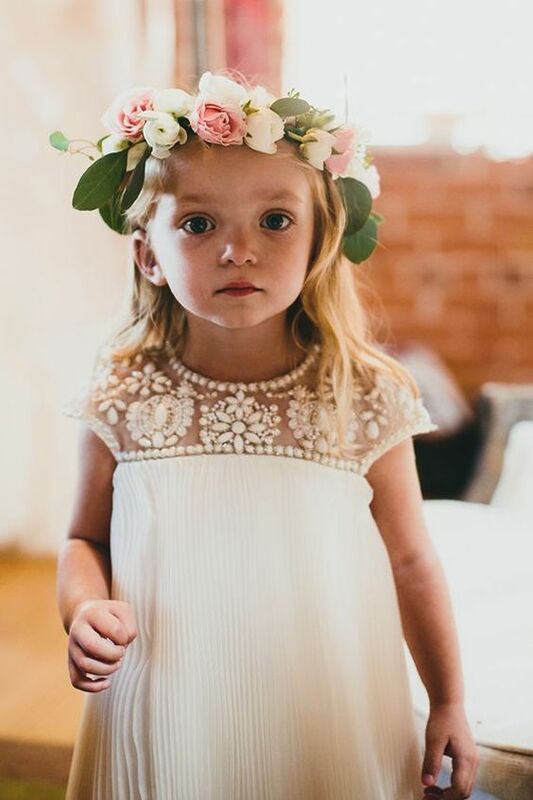 Now let’s consider all the options. 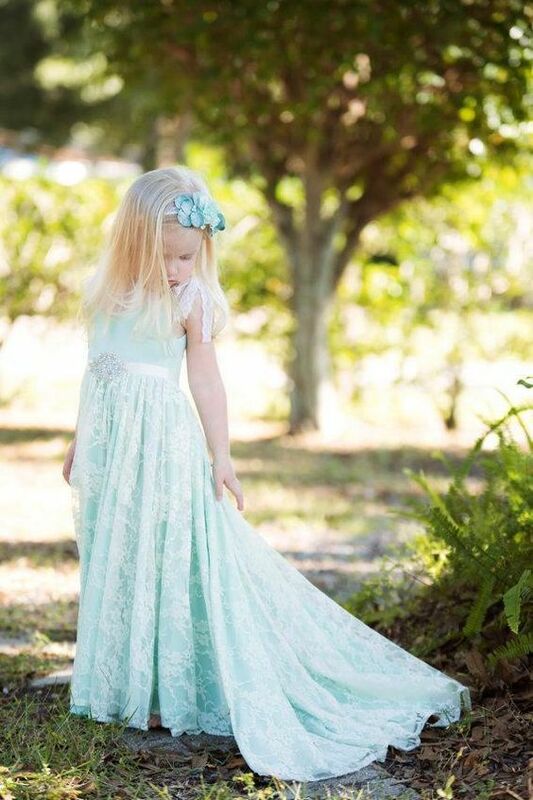 Maxi dresses are a beautiful choice for little girls, and you can find dresses that look very grown-up like, the girls will love them for sure! 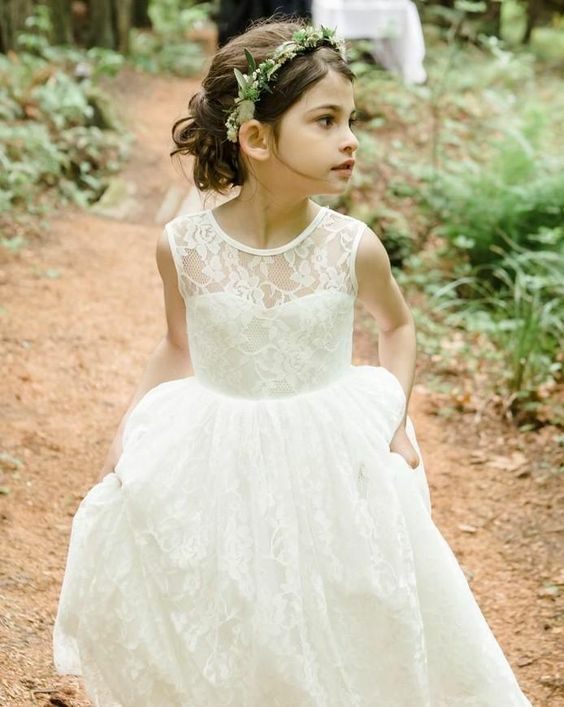 White and ivory ones, with ruffled skirts and crochet lace sleeves and pearl and rhinestone bodice detailing – these are gowns for every taste and every wedding theme. 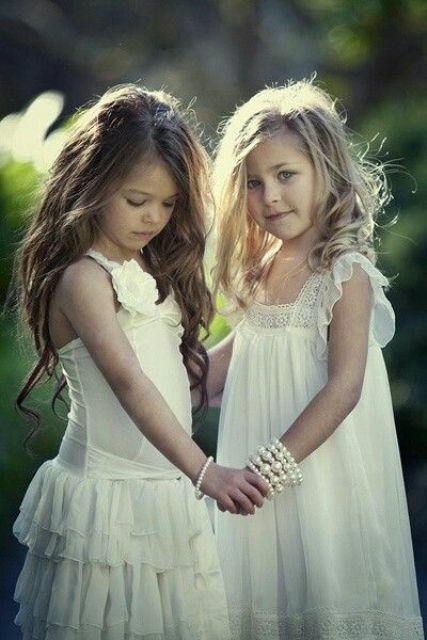 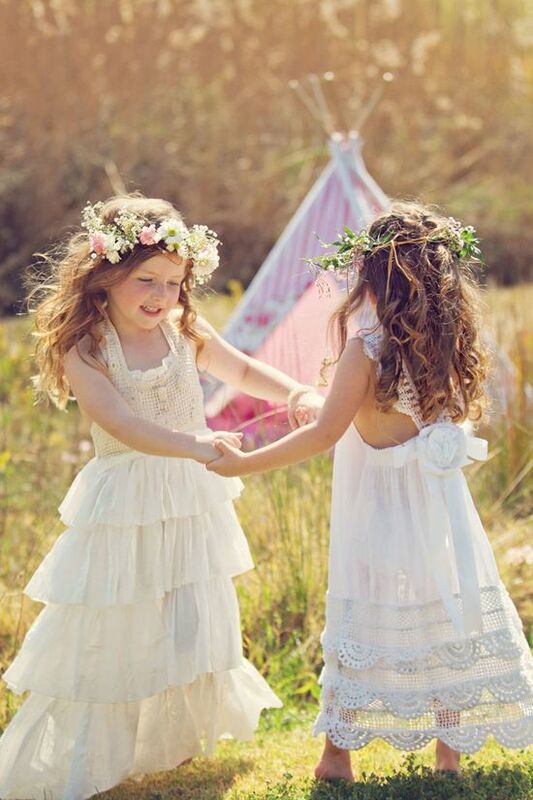 Choose light and natural fabrics to make the girls feel comfy and not to oversweat. 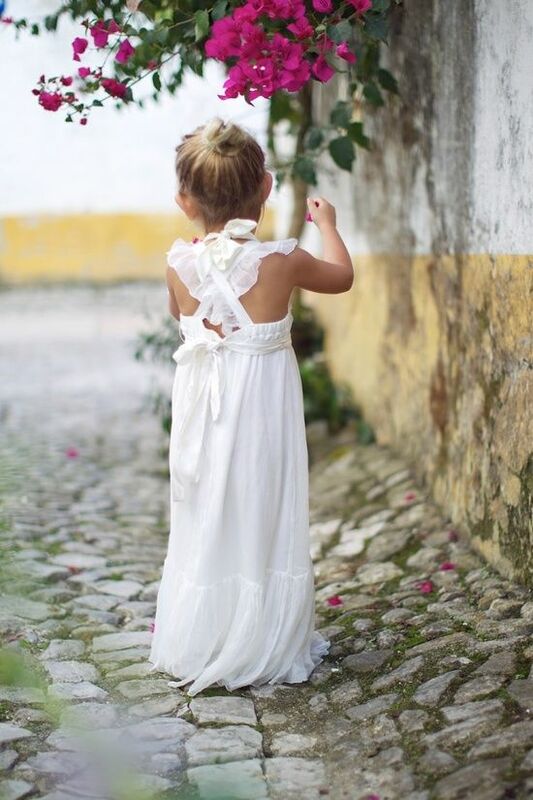 I totally love boho chic maxi dresses with ruffled skirts and criss cross ruffled straps on the back – they look very lady-like and sweet! 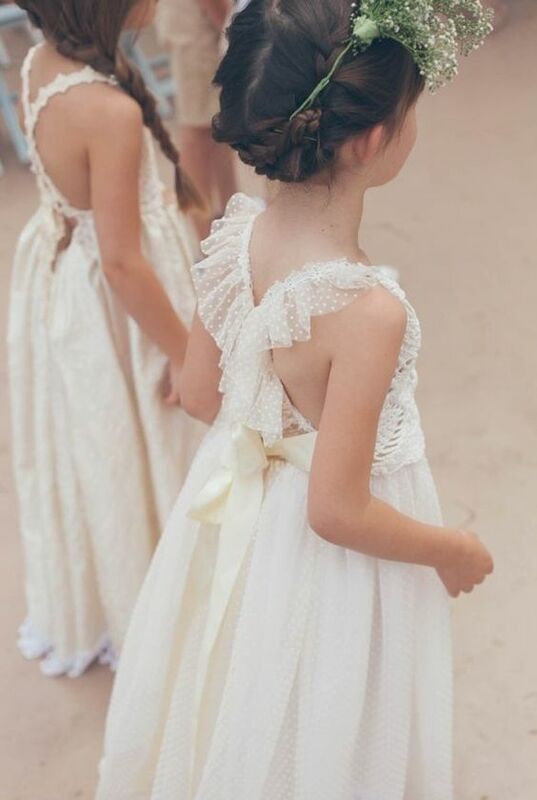 Midi dresses are much comfier for your girls because they allow comfortable walking, running and so on, so why not go for such a length. 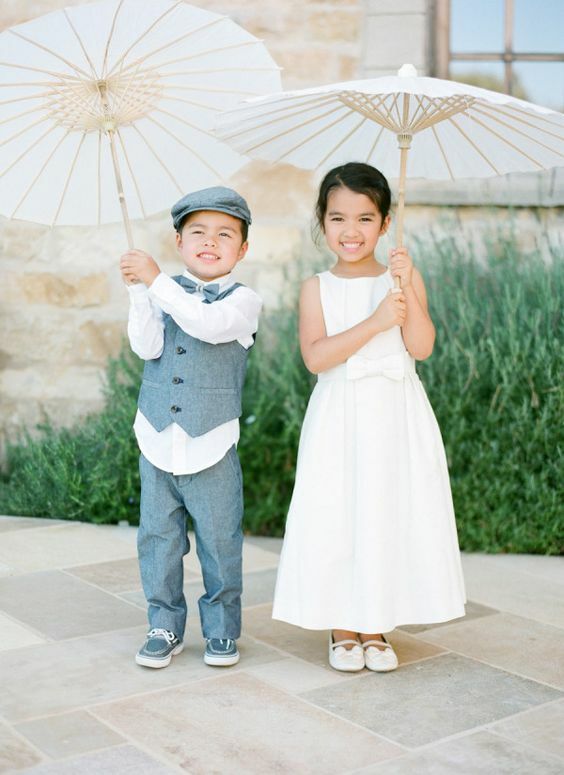 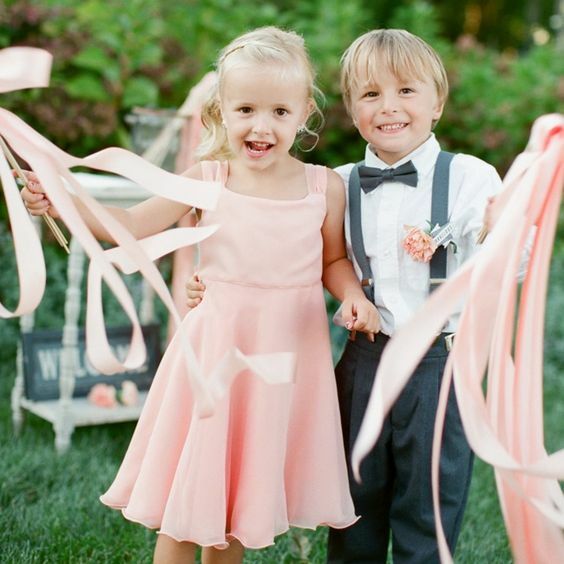 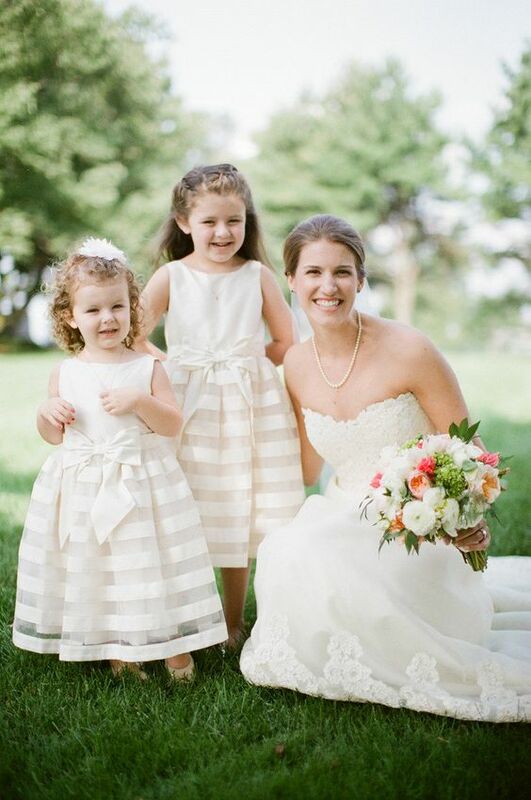 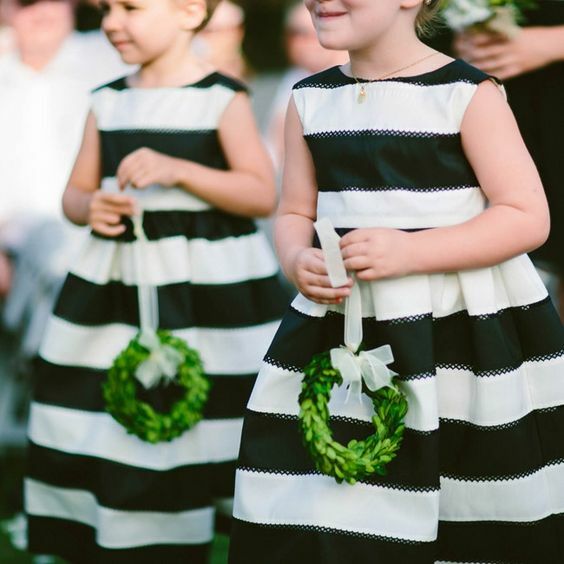 Ivory and white are the most popular colors for flower girls but if you want something different or if these shades don’t fit your wedding color scheme, try blush, mint or even striped black and white striped dresses. 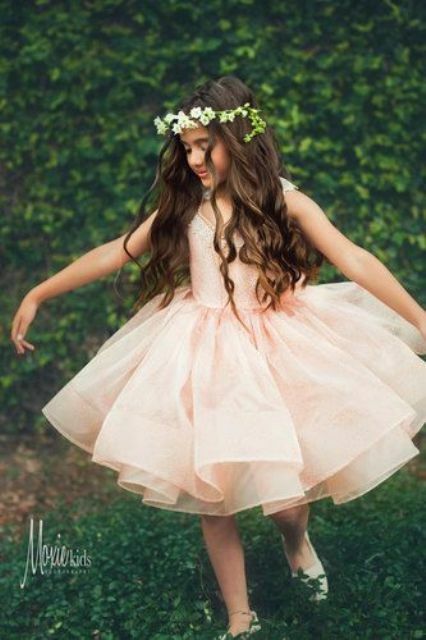 Ruffled skirts, rhinestone bodices, lace cap sleeves and other eye-catchy details will make your girls look stunning! 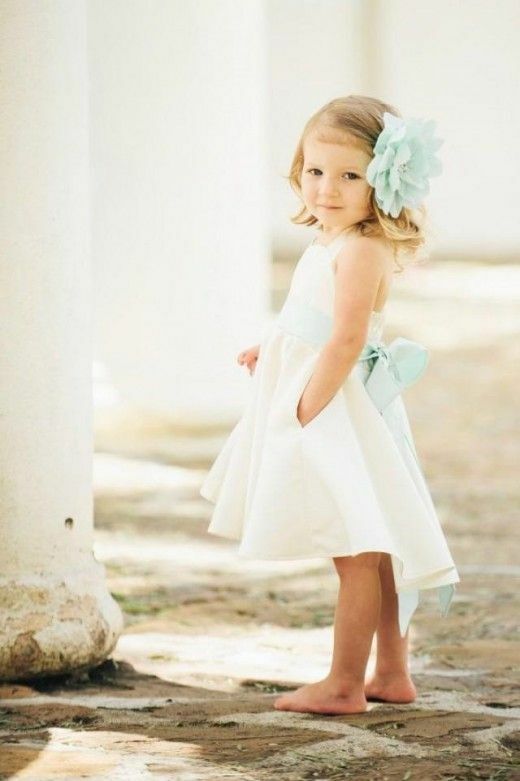 You also go for over the knee or knee gowns, which are also very comfortable for little girls. 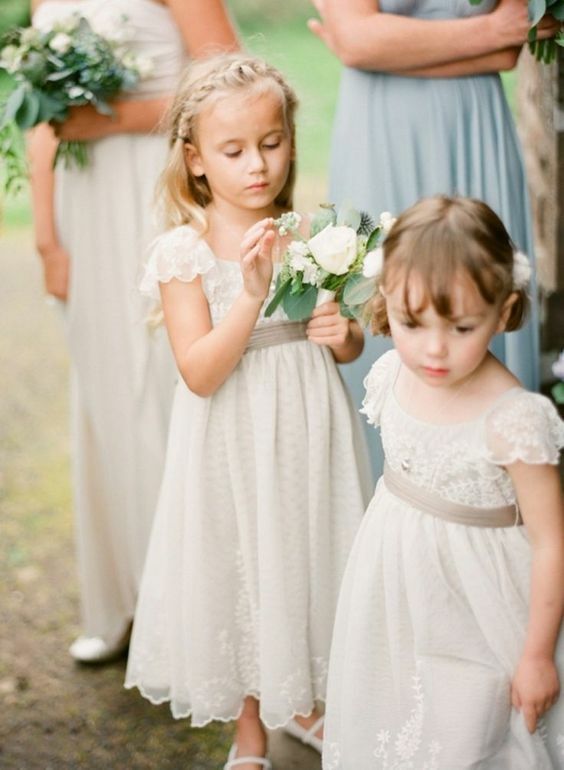 White, ivory, blush, pink and other colors, mainly pastel ones, are welcome! 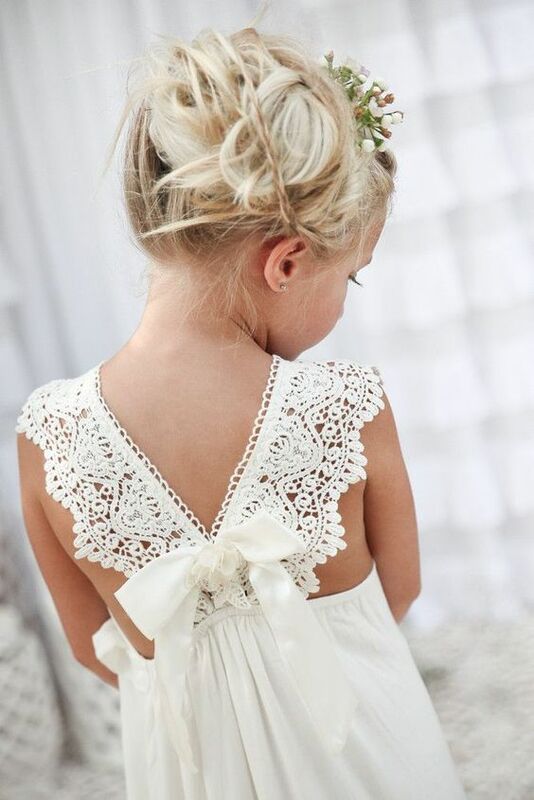 I love interesting skirts like feather-inspired or ruffled ones, eye-catchy lace bodices. 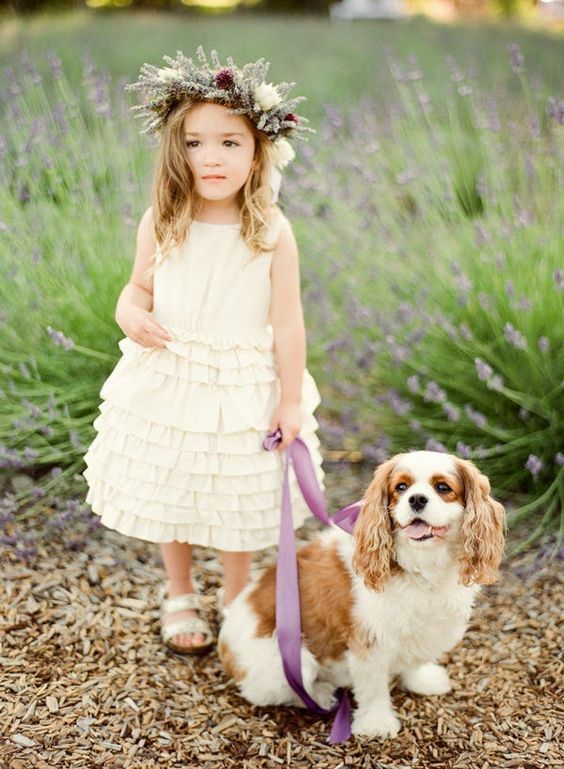 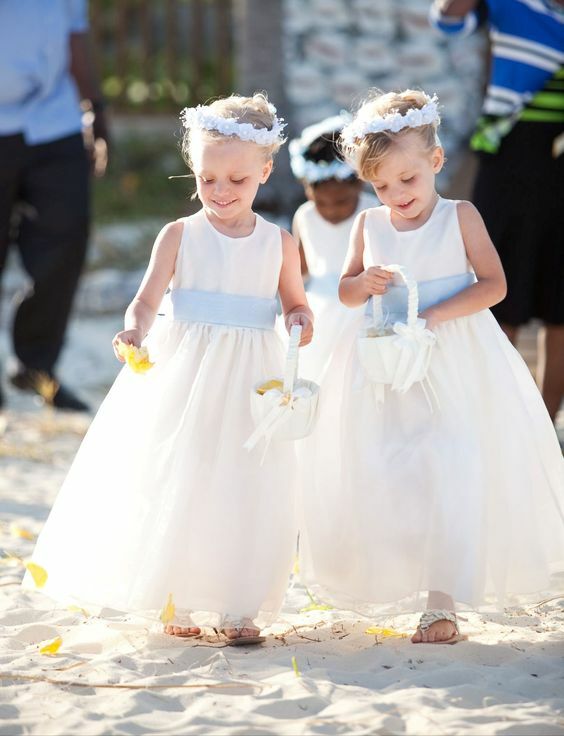 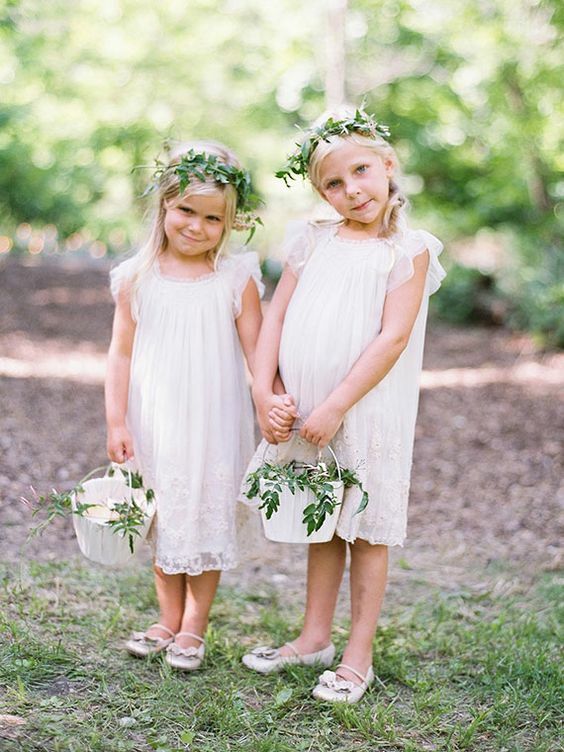 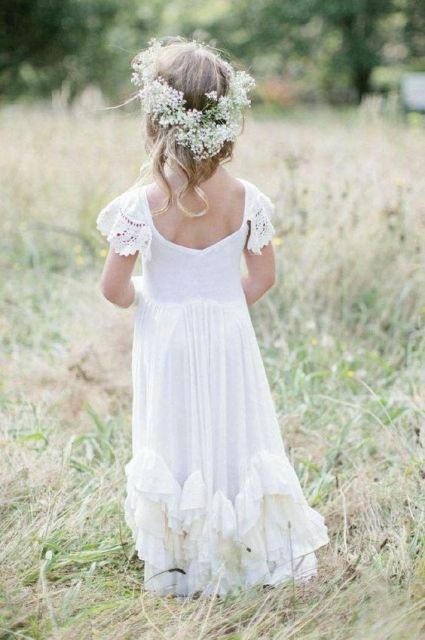 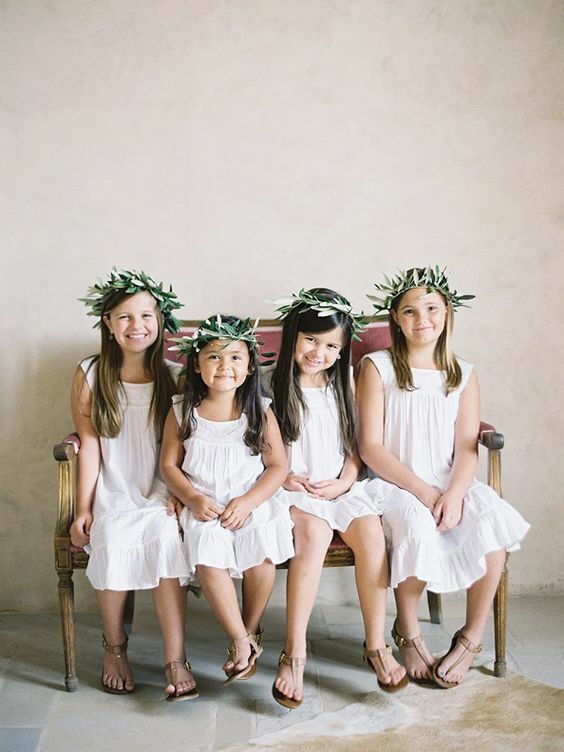 Accessorize your girls with cool flower leaf crowns, substitute sandals for cowboy boots if it’s a rustic wedding. 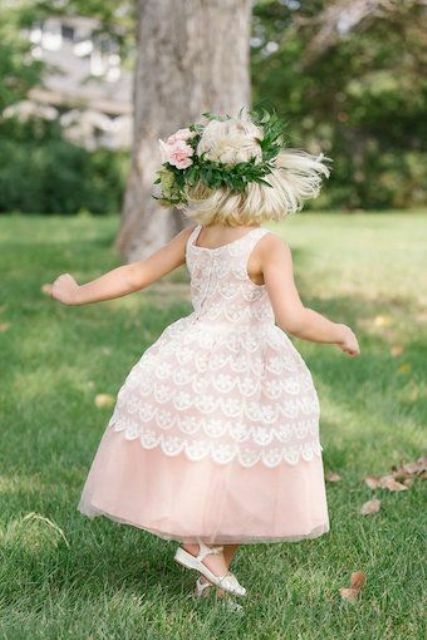 Actually, you can offer the girls mismatched gowns in one color or just different designs if they want to stand out a bit. 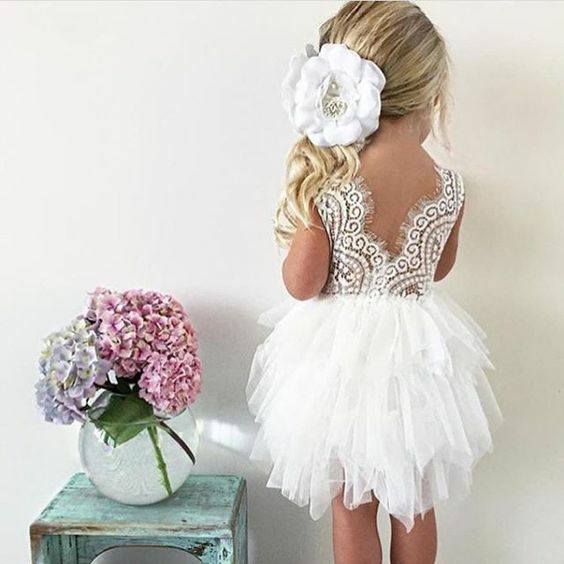 Get inspired and dress up the little princesses!